Gadhafi Vows 'Long War' After U.S., Allies Strike Moammar Gadhafi said he won't let up on the anti-government rebellion in the east, even after the U.S. and its European allies targeted his troops with airstrikes and dozens of cruise missiles. 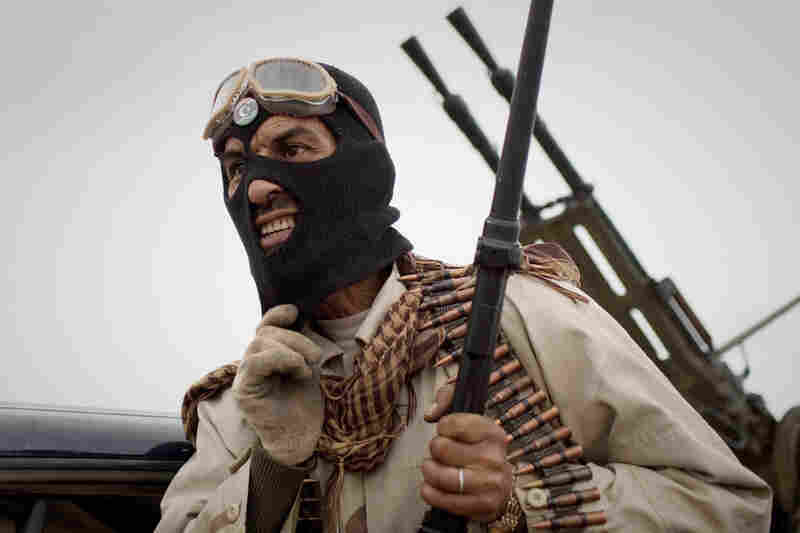 Gadhafi said he is arming Libyans with automatic weapons and bombs. "We promise you a long war," he said. The Arleigh Burke-class guided-missile destroyer USS Barry launches a Tomahawk missile from the Mediterranean Sea toward the Libyan coast on Saturday. The missiles targeted Moammar Gadhafi's radar and missile sites, to pave the way for a no-fly zone authorized by the U.N. Soldiers prepare a jet fighter at the military base of Saint Dizier, eastern France, on Saturday. 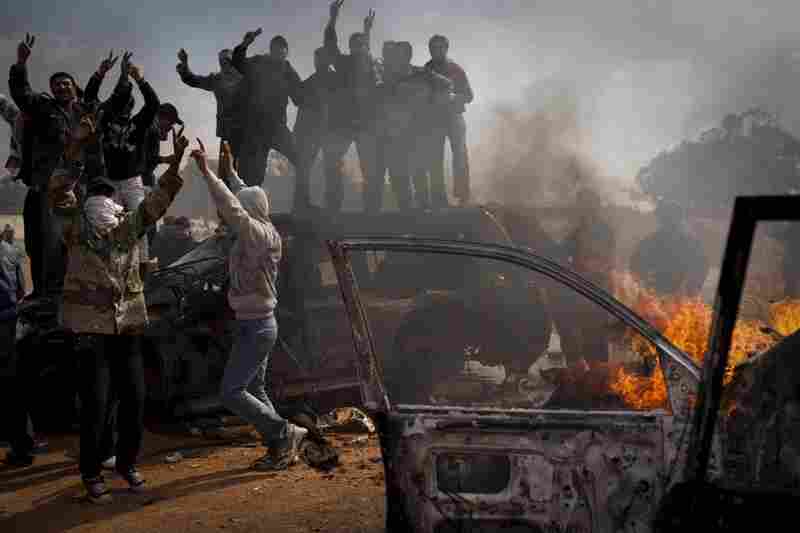 Libyan rebels celebrate next to burning cars after Libyan leader Moammar Gadhafi's forces where pushed back from Benghazi, eastern Libya. 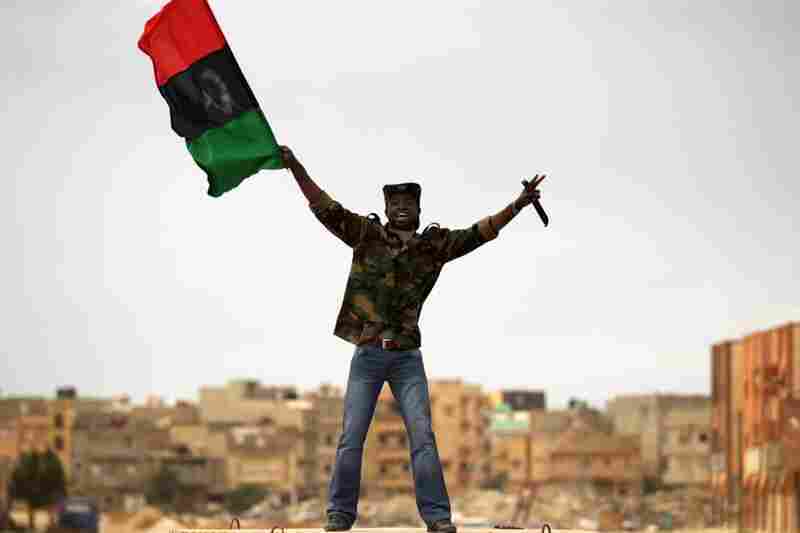 A rebel fighter waves a flag as civilians begin to flee shortly after airstrikes hit Benghazi. 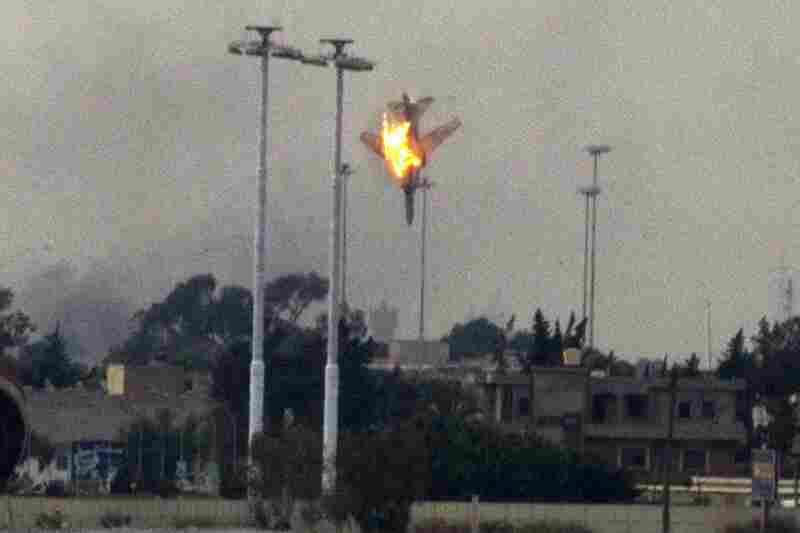 A plane is shot down over the outskirts of Benghazi. A Libyan man reacts after identifying his brother at the morgue in Jalaa hospital in Benghazi. 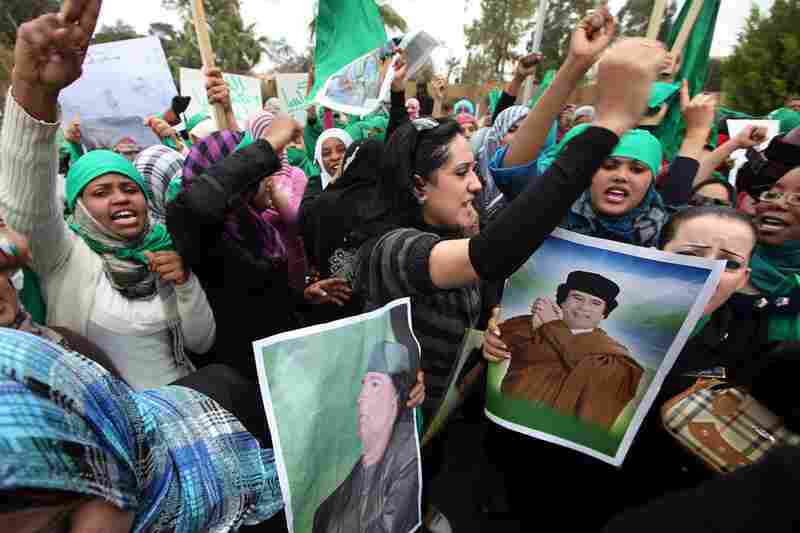 Demonstrators in Tripoli hold pictures of Gadhafi during a protest against the U.N. no-fly resolution. 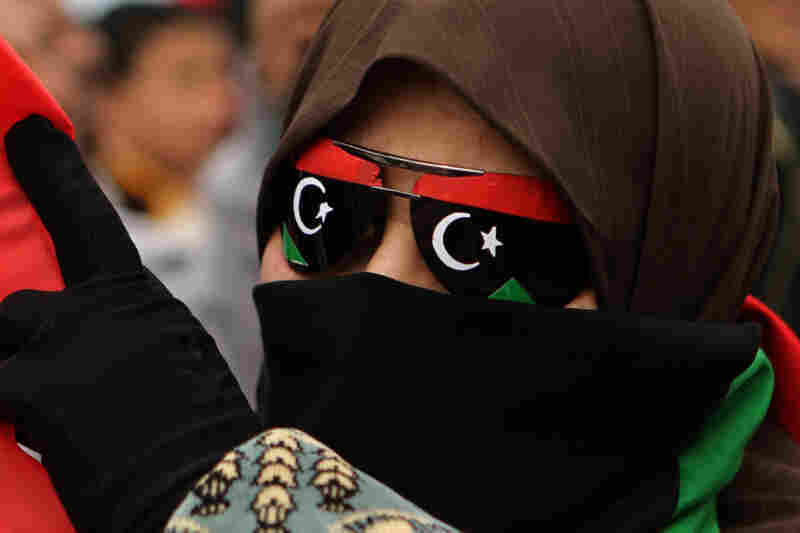 The resolution authorizes "all necessary measures" to protect Libyan civillans. 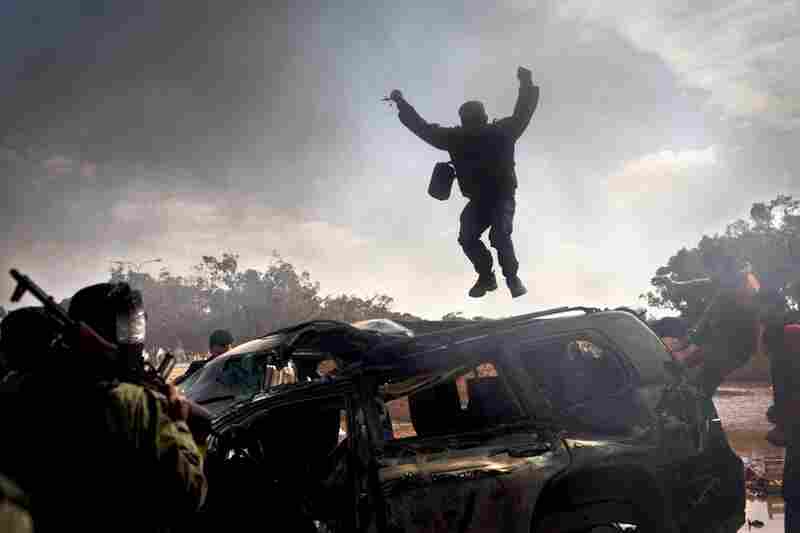 A rebel jumps on top of a burning car after Gadhafi's forces are pushed back from Benghazi. 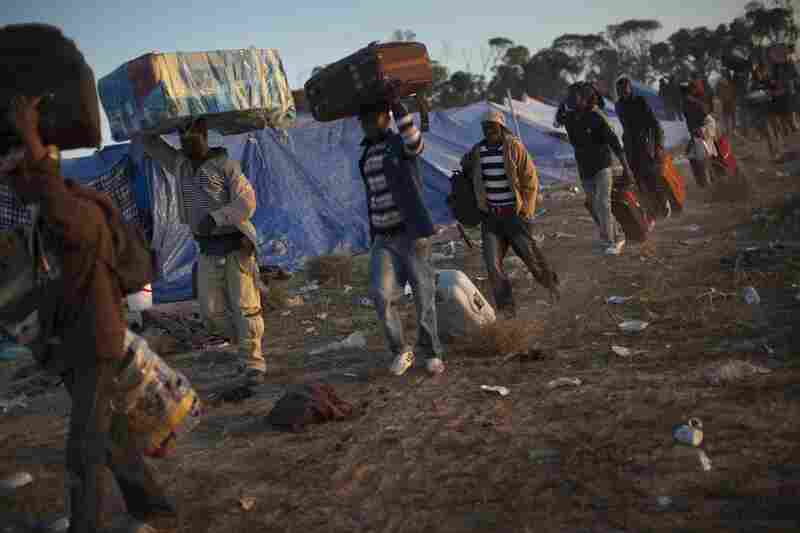 Workers fleeing the unrest in Libya arrive at a refugee camp at the Tunisia-Libyan border. 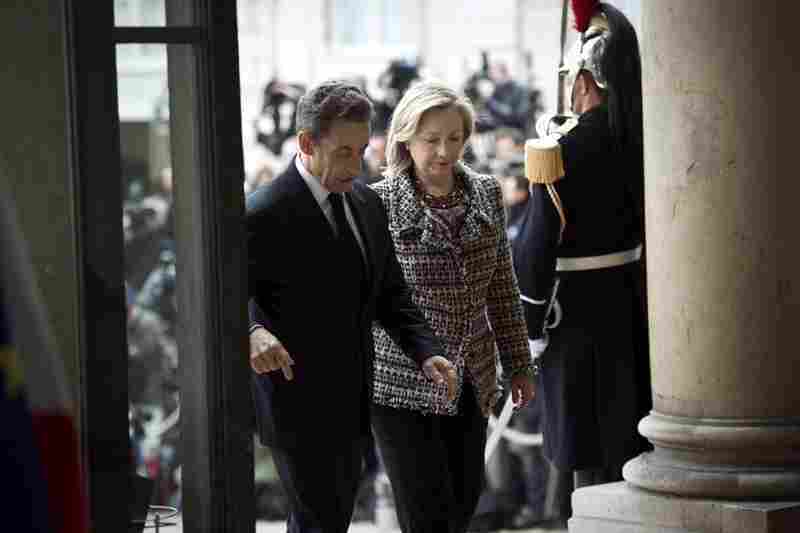 U.S. Secretary of State Hillary Clinton arrives with French President Nicolas Sarkozy at the Elysee Palace in Paris before a summit on implementing the U.N. Security Council resolution authorizing military action in Libya. 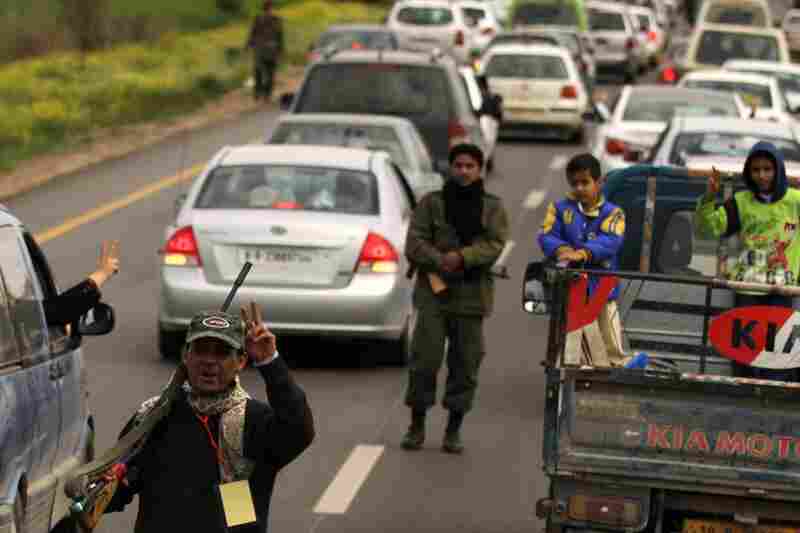 Rebel fighters direct a traffic of people fleeing from the city from Benghazi in the town of al-Marej. Libyan leader Moammar Gadhafi is promising "a long war" against the international military forces that have targeted his troops with airstrikes and dozens of cruise missiles. 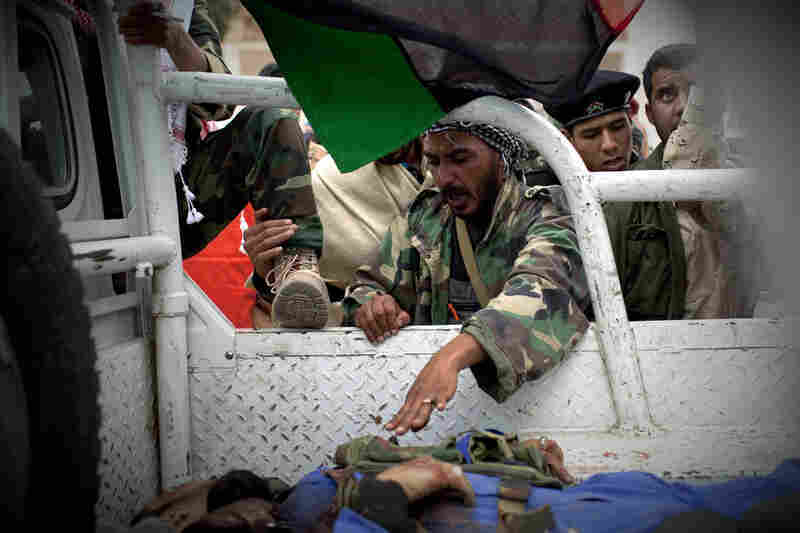 In a phone call to Libyan state television, Gadhafi says he will not let up on the rebellion in the country's east. He said he has opened up the weapons depots to Libyans, and said everyone is armed with "automatic weapons, mortars, bombs." "We promise you a long war," he said in the address. The U.S. and European strikes, which were aimed at enforcing a U.N.-mandated no-fly zone, were a sharp escalation in the international effort to stop Gadhafi after weeks of pleading by the rebels who have seen early gains reversed as the regime unleashed the full force of its superior air power and weaponry. 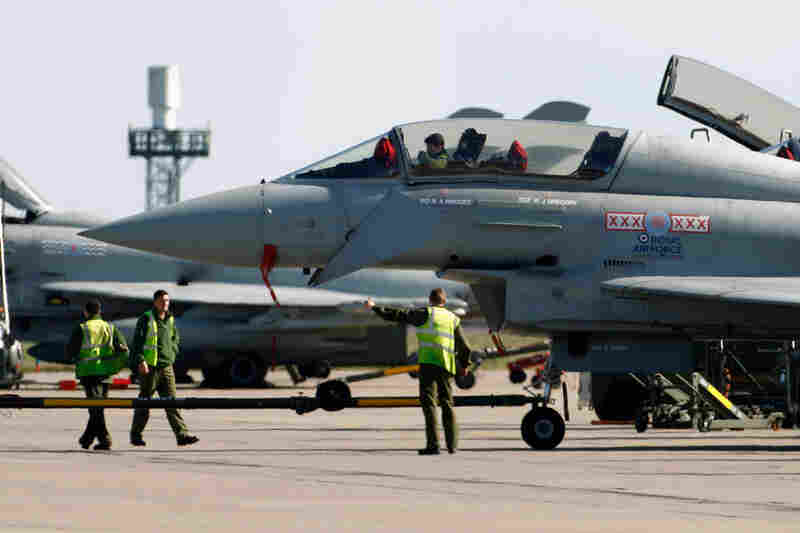 Meanwhile, NATO's top decision-making body is set to decide whether the alliance will join in the strikes on Libya. Diplomats said NATO's military planners are due to present final action plans to the North Atlantic Council on Sunday. Several NATO governments have indicated they would not participate in aerial attacks, pointing out that the alliance is already heavily engaged in the war in Afghanistan. 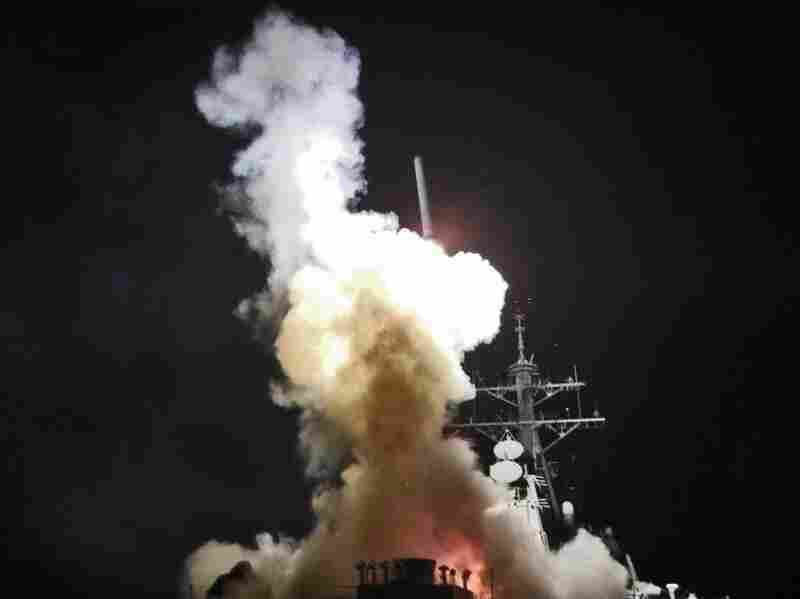 The U.S. military said 112 Tomahawk cruise missiles were fired from American and British ships and submarines at more than 20 coastal targets to clear the way for air patrols to ground Libya's air force. French fighter jets fired the first salvos, carrying out several strikes in the rebel-held east, while British fighter jets also bombarded the North African nation. President Obama said military action was not his first choice. NPR's David Greene said distant explosions could be heard in the capital just before 3 a.m. local time, along with minutes of sustained anti-aircraft fire. "You could see the bright lights of tracers crossing the sky, looking like they were coming from somewhere in the center of Tripoli," Greene said. By Sunday morning, he said, things had become much more calm. "It's a quiet morning so far, very silent — almost an eerie calm here in the capital." The International Committee of the Red Cross said it was "deeply concerned" about civilians and called on all sides work to distinguish between civilians and fighters and allow safe access for humanitarian organizations. Gadhafi, who has ruled Libya for 41 years, said the international action against his forces was unjustified, calling it "simply a colonial crusader aggression that may ignite another large-scale crusader war." Navy Vice Adm. William E. Gortney, director of the Pentagon's Joint Staff, told reporters in Washington that U.S. ships and a British submarine had launched the first phase of a missile assault on Libyan air defenses. Gortney said the mission has two goals: prevent further attacks by Libyan forces on rebels and civilians, and degrade the Libyan military's ability to contest a no-fly zone. Gortney said they hit more than 20 sites along the Mediterranean coastline, but the success of the mission, dubbed Odyssey Dawn, was not immediately clear. Defense officials cautioned it was too early to fully gauge the impact of the onslaught. But a senior defense official, who spoke on condition of anonymity because the mission was ongoing, said the Americans felt that Libya's air defenses had been heavily damaged given the precision targeting of the cruise missiles. Obama declared once again that the United States would not send ground forces to Libya, though he said he is "deeply aware" of the risks of taking any military action. The head of Libya's parliament, Mohammed Abul-Qassim al-Zwai, called the strikes "barbaric" and insisted Libya had kept its promise of a cease-fire. "This aggression will not weaken us," he said. Defense Secretary Robert Gates, who was scheduled to fly to Russia on Saturday afternoon to begin a weeklong overseas trip, postponed his departure for 24 hours. Pentagon press secretary Geoff Morrell said Gates decided he should remain in Washington to monitor developments in Libya at the outset of U.S. strikes. Gates had been skeptical of getting involved in Libya's civil war, telling Congress earlier this month that taking out Libya's air defenses was tantamount to war. Others have worried that the mission could put the U.S. on a slippery slope to deeper involvement in yet another Muslim country — on top of the wars in Iraq and Afghanistan. Top officials from the U.S., Europe and the Arab world were meeting in Paris, where they announced on Saturday immediate military action to protect civilians caught in combat between Gadhafi's forces and rebel fighters. As the military action was announced, French fighter jets swooped over Benghazi, the opposition stronghold that was stormed by Libyan government forces earlier Saturday, in defiance of a proclaimed cease-fire. France, Britain and the United States had warned Gadhafi on Friday that they would resort to military means if he ignored the U.N. resolution demanding a cease-fire. Among the U.S. Navy ships in the Mediterranean were two guided-missile destroyers, the USS Barry and USS Stout, as well as two amphibious warships, the USS Kearsarge and USS Ponce, and a command-and-control ship, the USS Mount Whitney. The submarine USS Providence was also in the Mediterranean. French President Nicolas Sarkozy said the allied nations would use "all means necessary, particularly military" to enforce the U.N. mandate. The French leader said the military action was being taken "to protect the civilian population" from the "deadly madness of a regime which, by killing its own people, has lost any legitimacy." 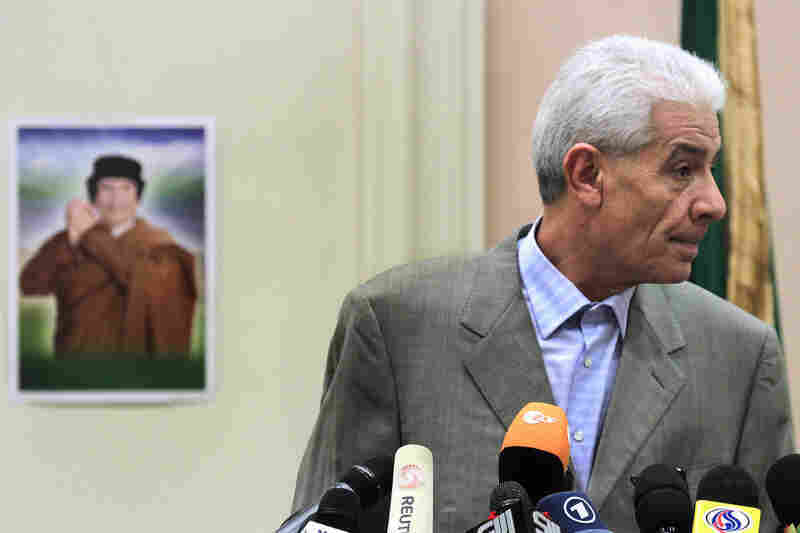 He said that Gadhafi "still could avoid the worst" by complying with the requirements of the international community. "The door of diplomacy will open when the fighting stops," he said. "The future of Libya belongs to the Libyans," Sarkozy said, adding that the intervention was taking place because of "a universal conscience that cannot tolerate such crimes." Canadian, Italian, Danish and Norwegian planes were also participating in the operation, working out of military bases around the Mediterranean region. 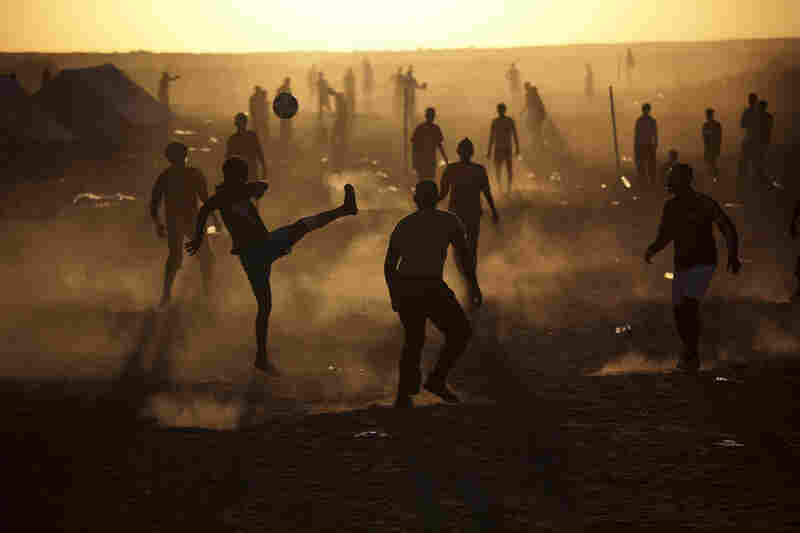 However, it was still unclear what role Arab nations would play. U.N. Secretary General Ban Ki-moon said in a statement Saturday that given the situation on the ground in Libya, "it is imperative that we continue to act with speed and decision." Earlier Saturday, a plane was shot down over the outskirts of Benghazi, sending up a massive black cloud of smoke. It was not immediately clear whether the warplane belonged to loyalist or rebel forces. "If it did indeed belong to the Libyan government ... it would be another sign that [Gadhafi] is in open defiance of the world right now," Greene reported. But rebels told NPR the plane was theirs and that it had been shot down by loyalist forces as it tried to defend the city. Opposition forces are known to have obtained at least some aircraft from pilots who defected from the Libyan air force in the opening days of the conflict. Witnesses said Benghazi was hit by artillery and mortar fire and an explosion was reported near the rebel headquarters. The Red Cross and other aid groups said there was a sharp increase in the number of civilians trying to leave the city. Greene said Libyan officials had confirmed there were pro-Gadhafi militias within Benghazi, who "as they put it, have been ... 'cleansing' terrorist' groups from outside the city." Rebel leaders fighting to push Gadhafi from power also said cities such as Misrata and Ajdabiya were still being shelled. A Pentagon official told NPR that the U.S. saw surveillance suggesting Libya's military was still active, firing on areas around the eastern city. In an open letter read out hours before the coalition announced immediate military action, Gadhafi had a warning: "You will regret it if you dare to intervene in our country." 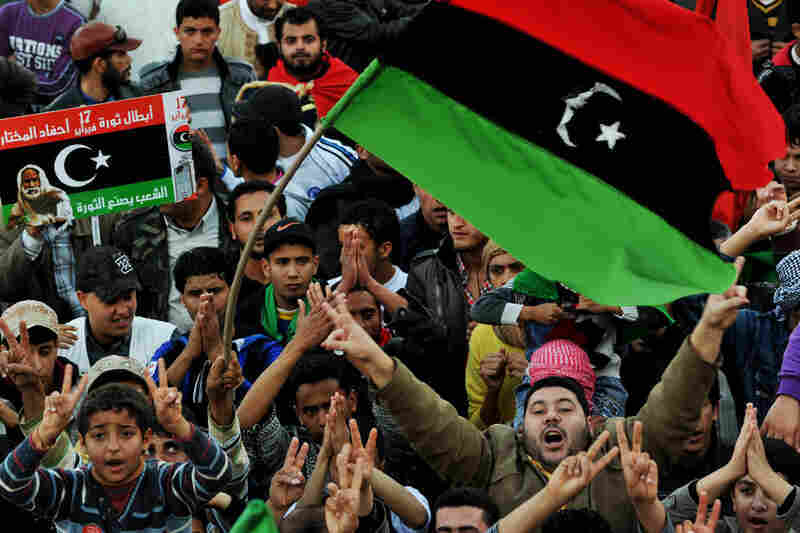 Greene reported that hundreds of his supporters had gathered Saturday at his compound in Tripoli, singing, dancing and expressing their support. "They said they came of their own free will," he said, "but it certainly was quite an orchestrated display for the international media." Government spokesman Ibrahim Musa denied government forces shelled any Libyan towns on Saturday, saying the rebels were the ones breaking the cease-fire by attacking military forces. "Our armed forces continue to retreat and hide, but the rebels keep shelling us and provoking us," Musa told The Associated Press. 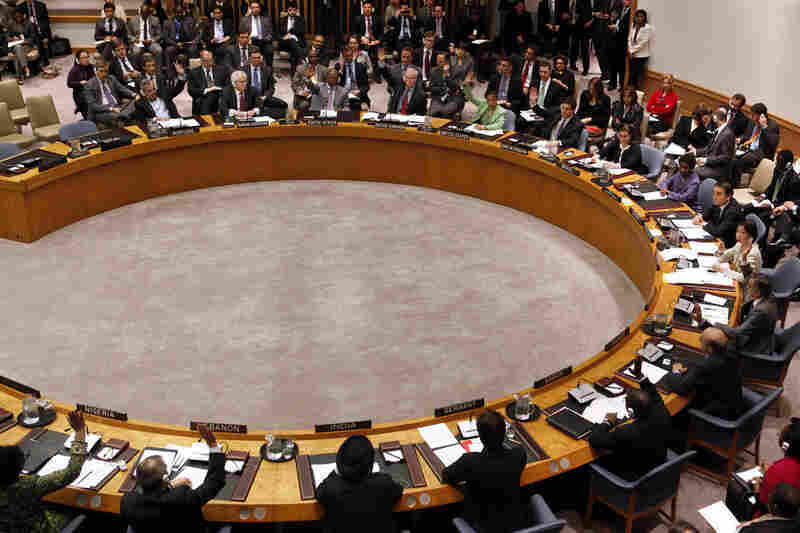 Musa also said the planned U.N. Security Council embargo of Libya's military airspace was "invalid" because, he said, "the Security Council is not authorized according to the U.N. Charter to intervene in the internal affairs of any country." "This is injustice, it's a clear aggression and there's an uncalculated risk for its consequences on the Mediterranean and for Europe," Musa said. In a joint statement to Gadhafi late Friday, the U.S., Britain and France — backed by unspecified Arab countries — said a cease-fire must begin "immediately" in Libya, the French presidential palace said. The statement urged Gadhafi to end his troops' advance toward Benghazi and pull them out of the cities of Misrata, Ajdabiya and Zawiya. It also called for the restoration of water, electricity and gas services in all areas, and said Libyans must be able to receive humanitarian aid or the "international community will make him suffer the consequences" with military action. The statement followed a U.N. Security Council resolution offering protection to Libya's citizens late Thursday with the backing of the United States, France and Britain — hours after Gadhafi vowed to launch a final assault and crush the nearly five-week-old rebellion against him. Western powers faced pressure to act urgently after weeks spent deliberating over what to do about Gadhafi as his regime gained momentum. "Things really came together quickly at the end," said NPR's Greene said. "There was a sense for days that this might never happen, the debate might continue. "All sides said the support from the Arab League and potentially the willingness of Arab countries to take part in this lent that final needed support to push this through," he said. 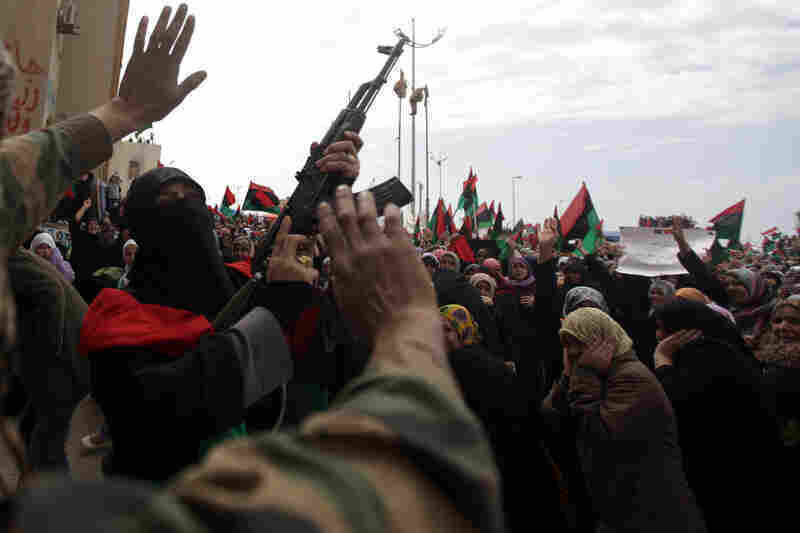 The rebellion began Feb. 15 in Benghazi and spread east to Tripoli. 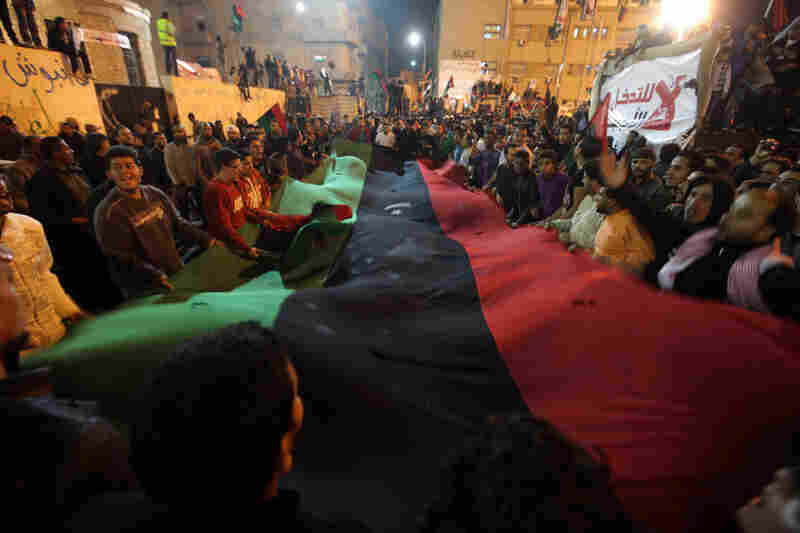 Like other uprisings in North Africa and the Mideast, Libya's protest started with popular demonstrations against its leader, rejecting Gadhafi's four decades of despotic and often brutal rule. The tone quickly changed after the regime's security in Tripoli forcefully put down the gatherings there. 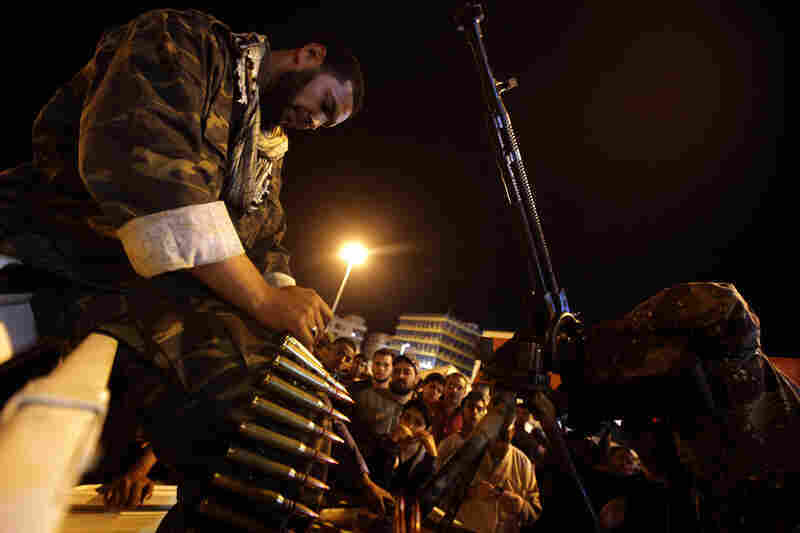 Opposition forces began arming themselves and quickly seized control of the country's east, basing themselves in Benghazi, which is Libya's second-largest city and has a population of about 700,000. Some Libyan army units joined the rebels, providing them with needed firepower, but much less than Gadhafi's remaining forces and, crucially, no air power. With reporting from NPR's Eric Westervelt in Tobruk, David Greene in Tripoli, Eleanor Beardsley in Paris and Phillip Reeve in London and Alan Greenblatt. Material from The Associated Press was used in this story.